Cue “Pomp and Circumstance”: Duo recently hosted one very special graduation, including the first Courthouse Dog to be placed with the St. Louis County Prosecuting Attorney’s office. 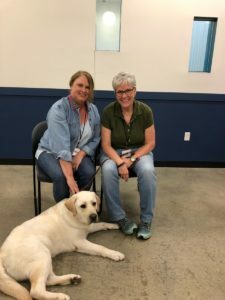 Levi, a yellow labrador, is specially trained to be part of the forensic interview process when the Prosecuting Attorney’s office is working with children who may have been physically or sexually abused. If necessary, Levi may accompany the victim to court and stay by their side to provide comfort. Duo’s professional staff has been working with Levi for two years, teaching him to remain quiet in any circumstance, stay still for long periods of time, follow a long list of commands, and be comfortable with people of all ages. He is from the same litter as Oliver, Duo’s first overseas placement and the only support dog within the British justice system. “We couldn’t be more proud to help people and children within our community through our Courthouse Dogs program. Levi has the ability to transform many lives; this is what Duo is all about,” said Duo President and CEO Anne Klein.